Are we killing our rockstars? Dub War have recorded their first new song in almost two decades – and you can listen to it exclusively on TeamRock. The track Fun Done, which you can stream below, is their first new material since splitting in 1999. The band made their live return in 2014 for a low-key show in their hometown of Newport and followed it up with an appearance at last year’s Download. Vocalist Benji Webbe – who now fronts Skindred – tells TeamRock that these performances sparked the idea to return to the studio. 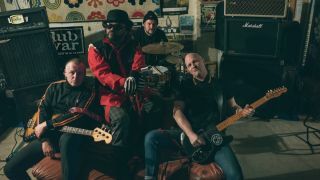 Says Webbe: “We had a really good time playing Download, but we’ve always wondered what Dub War would sound like now. I haven’t worked with those guys for such a long time, so I just wanted to see what it would feel like to do something fresh and new. Webbe says that the band plan to release a seven-inch single every three months, with a view to collecting the tracks on a full-length album. More details about Dub War’s single releases will be announced in the coming weeks.